Farmers prepare land to plant turmeric. Bheri Ganga village, Surkhet district, western Nepal. The number of people hungry around the world is up for the first time in more than a decade, says a new United Nations report issued today, pointing to violent conflicts and climate change as the major drivers. “This has set off alarm bells we cannot afford to ignore: we will not end hunger and all forms of malnutrition by 2030 unless we address all the factors that undermine food security and nutrition. Securing peaceful and inclusive societies is a necessary condition to that end,” said the heads of five UN agencies in their joint foreword to the report. The report, launched in Rome, is the first UN global assessment on food security and nutrition to be released following the adoption of the 2030 Agenda for Sustainable Development, which aims to end hunger and all forms of malnutrition by 2030 as a top priority. Some 815 million people were hungry last year – an increase of 38 million from the previous year – affecting some 11 per cent of the world population, according to UN figures. Some of the highest proportions of food-insecure and malnourished children in the world are now concentrated in conflict zones, according to The State of Food Security and Nutrition in the World. Earlier this year, famine struck parts of South Sudan, and there is a threat of famine in conflict-affected countries such as Nigeria, Somalia and Yemen. Even in regions that are more peaceful, droughts or floods linked in part to the El Niño weather phenomenon, as well as the global economic slowdown, have also seen food security and nutrition deteriorate, added the agencies – the Food and Agriculture Organization (FAO), the International Fund for Agricultural Development (IFAD), the UN Children’s Fund (UNICEF), the World Food Programme (WFP) and the World Health Organization (WHO). Cindy Holleman, senior economist with FAO, said the report is one of the first to review malnutrition among children, as well as obesity among children and adults. “This is a growing problem worldwide and also has significant implications for people’s health and living,” said Ms. Holleman, noting that some countries have problems of malnutrition, as well as obesity. 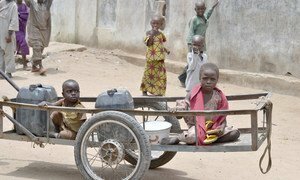 Twenty million people risk dying of hunger in South Sudan, Somalia, Yemen and the north-east of Nigeria, including 1.4 million children suffering from severe malnutrition, the United Nations food relief agency said, spotlighting today its worldwide campaign to fight famine.